Turkish artillery has fired on targets in Syria after shells from across the border killed five Turkish nationals. 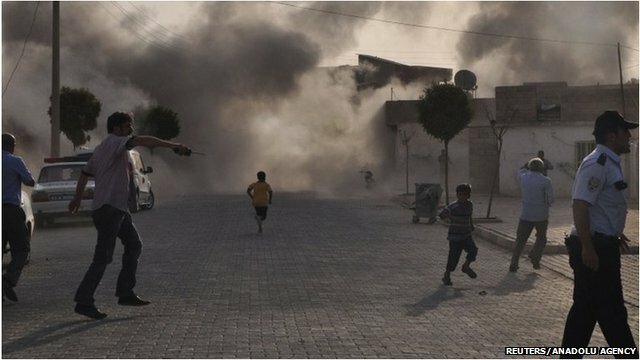 Several Syrian troops were killed by Turkish fire, activists from the Syrian Observatory for Human Rights said. Turkey’s border town of Akcakala was shelled, apparently by Syrian government forces, on Wednesday, killing a woman and three children. The UN Security Council is due to meet later on Thursday to condemn Syria’s actions. Ankara’s response marks the first time it has fired into Syria during the 18-month-long unrest there. Turkey also asked the UN Security Council to take “necessary action” to stop Syrian “aggression”. The request was made by Turkish envoy to the UN, Ertugrul Apakan, in a letter to the current president of the 15-member Council, Guatemalan ambassador Gert Rosenthal. Meanwhile, Nato envoys held an urgent meeting in Brussels at the request of Turkey, who is a member of the military alliance.